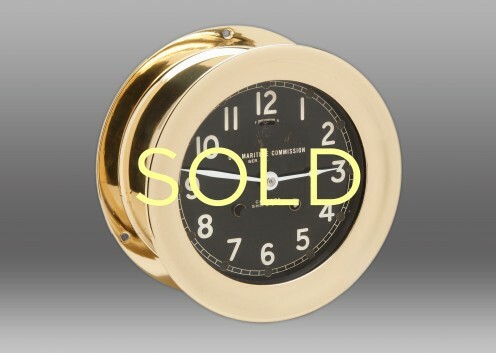 WWII Chelsea Ships Bell Clock with original 6” black dial made for the U.S. Maritime Commission in 1945. During the war years Chelsea produced numerous clocks for the Commission, but the majority of these were produced in cases made of Phenolic Resin (also known as Bakelite) due to the shortage and strict allocation of brass. This Ship’s Bell model has a brass case with screw bezel for use at sea. The case has been polished and lacquered and the Model L movement has been completely serviced by our expert staff. Comes with a 2 Year warranty and Certificate of Authenticity. Serial Number 496424.